Many people are unaware of how their chin affects their overall facial shape and proportion. A chin that is in balance with the other features of the face, one that has an appropriate projection, length and shape can greatly enhance other facial features. This is particularly true when you evaluate the nose because a small or receding chin may cause a nose to appear too large or, more specifically, too long. Also, when considering a face lift to create a more balanced and rejuvenated appearance in the lower facial region and neck region, chin surgery can be an asset to the overall facial shape as well as provide much needed support for the overlying muscle and connective tissues as the aging process progresses. The underlying bony support of the face is truly the framework for how the soft tissues age over time. With improved underlying support, the patient benefits with results that are more attractive, natural and longer lasting. A third group that benefits from chin surgery are individuals with a genetic predisposition to full necks, creating the appearance of a “double chin”. While it is possible that this can be solved with liposuction or skin tightening, oftentimes adjusting the shape, projection or length of the chin can be efficacious alone. Most patients have little awareness of how their chin affects their overall looks. Dr. Hobar analyzes a face both visually and then with measurements. If he recommends genioplasty, he will show you before and after photographs highlighting the changes. He will then invite you back for a computer imaging representation of what a genioplasty will do for you. The patient with a “weak” looking lower face – Sometimes a person has strong upper facial definition, but is lacking in lower face definition and there is obvious imbalance between the two. 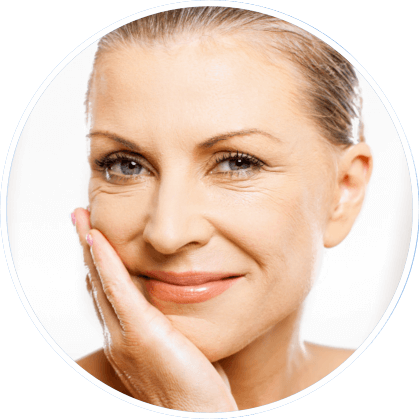 Patient with premature aging of the lower face and neck – A weak or small chin is also a major factor in some patients presenting for a lower facelift or necklift. The lack of bony support in a weak lower jaw really predisposes to accelerated aging in the lower face and neck. Patients presenting for rhinoplasty with a nose that is “too long” for their face – Nothing makes a nose look too long for a face more than a small chin. Dr. Hobar has published work on measurements of facial proportions in faces chosen for their attractiveness (models and beauty contestants) based on a large study he completed while in training in late 1980s. Dr. Hobar will do a complete facial analysis with you and discuss the balance of your facial features. If he recommends changing the dimensions of either the nose or the chin he will personally do a computer imaging of the changes he recommends. Most importantly, it is essential that you be in good physical health. Chin surgery is very safe and effective when the patient is in sound physical condition. It is important to disclose all of your current and past health conditions as well as any prescribed or over the counter medications or supplements you take. After a careful review of this information, Dr. Hobar might suggest certain preoperative tests to ensure that you are a good surgical candidate. If you are unhappy with the overall appearance of your chin in profile, you are likely a good candidate. If you lack adequate bony support in your chin to create a platform for the soft tissues of the neck (the muscle, fatty tissue and skin) to drape smoothly, you might be a good candidate. If your chin location is out of proportion with your face – if it is either too short, too long or the projection is not ideal, then you are a good candidate. Dr. Hobar performs most of his cosmetic surgery in the accredited Baylor Surgicare North Dallas. With the latest, cutting-edge equipment and a fully trained staff specializing in cosmetic surgery, this is an ideal place for his patients. Your chin surgery is usually scheduled for roughly one to two hours which enables Dr. Hobar to work in a focused and precise manner. You are put to sleep under general anesthesia by a well trained anesthesia professional that Dr. Hobar regularly works with and would trust with his family. General anesthesia ensures a very well controlled, safe surgical experience. After surgery, you are taken to a recovery room where you are closely monitored as you awaken from anesthesia. You can choose to either go home after leaving the recovery room or you may opt to stay the night at The Cloister, a luxurious hotel attached to the Dallas Day Surgery Center where you can recuperate in a relaxing environment with 24 hour nursing care. Dr. Hobar will use a variety of techniques to conduct your chin surgery, depending on your specific goals. Regardless of the technique used, he will make an incision inside your mouth far below your gum line. This incision and the subsequent work he does is below the jaw and thus does not interfere with the nerve and blood supply to your lower teeth. After performing your chin surgery, the incision is closed with dissolvable suture. Typical recovery from chin surgery is relatively simple. It is likely that you will experience temporary swelling in the area. You will be required to use a mouthwash to clean the incision inside your mouth. A few people experience moderate bruising in the chin area and occasionally along the bottom of their lower front teeth. Dr. Hobar usually requires you to wear a chin strap – a wrap around your face – full time for a week. After that, depending on the degree of swelling that remains, he might recommend that you continue to wear the strap at night while you sleep for an additional week or two. The stitches inside your mouth usually dissolve within ten days. Keep in mind that the healing process is just that – a process. The swelling peaks a day or two after the surgery and most patients are able to resume public interaction after a week or so. Most patients’ experiences with chin surgery are not characterized as being painful. Instead, they experience a soreness or aching sensation that is well controlled with medication. It is important that you refrain from eating tough food, such as steak, for the first week or two. Softer foods that are easier to chew are appropriate.